For those of us fortunate enough to live in warm weather states like California, Texas, Arizona and Florida, we get to play golf year round. Lately however, a cold snap has struck in the US and virtually every spot in the nation has seen freezing temperatures. I was born and raised in Canada and the Northeastern US, so I’m no stranger to cold weather golf. Although I now call Florida home, even we aren’t totally immune to the cold. In fact, I remember one morning a few years ago in Orlando when it was actually colder than Juneau, Alaska! With the high humidity in the air down here, 40 degrees feels more like 20. Being from Canada (and also being slightly crazy), I’ve played plenty of golf in cold, miserable conditions. My friends here in Florida usually stay inside when it drops below 60, but sometimes they venture out for a round, and their lack of preparation leads to a crappy day, and crappy scores! So without further ado, here are my tips for playing your best cold weather golf! Tip #2 – Keep your hands warm! This is the single most important tip for cold weather golf! Your hands are your only link to the club, and you need feel to play good golf. If your hands are frozen, you lose all your feel and your game will suffer, especially around the greens. Get yourself a nice pair of mittens and/or some hand warmers for your pockets. Wear the mitts whenever you aren’t hitting a shot, and take them off prior to hitting. Tip #3 – Cover your head and ears! Some say that between 7 to 55 percent of your body heat can be lost through your head. Whatever the science is behind it, it’s smart to cover your head and ears with a wool hat or ear warmers. You’ll be more comfortable. Get yourself a nice ski tuque like mine, and at the very least it will be a great conversation piece! Tip #4 – Play a softer ball. Golf balls don’t have compression ratings any more since wound balls went away, but some balls are softer and in cold weather you’ll want a ball that is easier to compress. A hard rock ball like a Top Flite XL will feel like a steel ball bearing on a cold day, so opt for a softer option, like the new Srixon Q-Star. Tip #5 – Use more club! 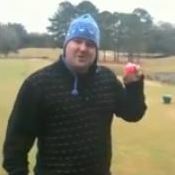 Check the ego at the pro shop bruiser, the ball doesn’t go as far in the cold. You might have to take one for the team and hit 2 more clubs on every approach shot, but at least you’ll be sure to get to the hole. Because the ball doesn’t go as far, also consider playing one tee up from your normal length. There’s nothing that will ruin a day faster than having to hit three wood into every par three and four. Tip #6 – Channel your inner Scotsman and play the ground game. If it’s bitter cold outside, it’s likely the ground will be hard too. So use that to your advantage and play some run up shots and bump and runs. Forget the flop shot in the cold, as the ball won’t spin, the greens are harder and if you aren’t wearing mitts, your hands will feel like steel pliers on that lob wedge. Tip #7 – Dress in layers. It might keep you warm, but wearing your ski parka will turn your golf swing into a slap shot. You simply can’t make a full turn in a jacket. Instead, wear a turtle neck or insulating layer followed by a shirt and thin sweater or wind shell. This layered approach will keep you warm and still allow you to make a full golf swing. You can always wear that jacket between shots if it’s really cold, but take it off when you hit. Tip #8 – Don’t stop drinking fluids! Many people will substitute water and Gatorade with coffee and hot cocoa when it gets cold, and their game suffers. Your body still needs nutrients and hydration even when it’s cold, and coffee just doesn’t cut it. So, have your hot cocoa, but don’t forget to take a few sips of that sports drink every hole to stay properly hydrated. Tip #9 – Hit it solid! That should be a no-brainer and it’s not really a tip, since the goal of every golf shot should be solid contact. But seriously, you’ll know what I’m talking about the first time you take a mighty lash with a 3 iron and hit it a few grooves too low. Ouch! Tip #10 – Relish the challenge. Tom Watson got it. He loved playing in adverse conditions. You see, he knew that half the field was virtually eliminated before they even started because they dreaded being cold or getting wet and didn’t really want to be there. I love playing in harsh conditions for the same reason. If my opponent is hating life out there, I have the advantage because I’m much less likely to get rattled by the conditions. So relish the challenge of cold weather golf and take solace in the fact that most everyone out there with you is miserable! At the very least, it will make you feel better. Don’t forget to check in with our Facebook fan page and get involved by leaving us comments on what you think! I have a new found respect for those “northern” golfers who play in these temperatures..
Dave, they were Titleist Cart Mitts. They are like regular mitts, but have a flat that opens in the front to slide them up your arm so you can hit the shot, they you slide them back down to keep warm. They rock! I agree it is sometimes to have a great game when it’s too cold. I agree with the ten tips but I believe that one more will make your cold day a little better. Most of our players have the three wheel cart that has the cup holder. We have a ceramic disc that attaches to a propane tank, the ones that go one the portable grills. This becomes a great hand warmer and it helps keep the balls warm,speaking of which, you shuld always keep a ball in your pocket to help it stay warm. Switch balls every hole. This article was just posted at Tallahassee.com with no mention of where it came from. Becky Sauers may need a reminder of the word plagiarism. Thanks for bringing this to our attention. Mrs. Sauers and her cut & paste writing techniques will be dealt with accordingly. as a fellow canadian about to go on the “annual” golf trip, this year to canmore and kananaskis (where it will be cool) I can appreciate everything you said! mittens here i come! I really agree with tip number 5 and that is to use more club. This is something I have found consistently happens in Winter. The colder air holds the ball up more and you always come up short. Excellent advice. We’re up in the Northeast so we’ve been dealing with this our entire lives. If there’s no snow on the ground and it’s warm enough to hold a club, we’re out there. Thanks for your tips. It is really hot where I am all year round. Could you provide some tips for hot weather golf?